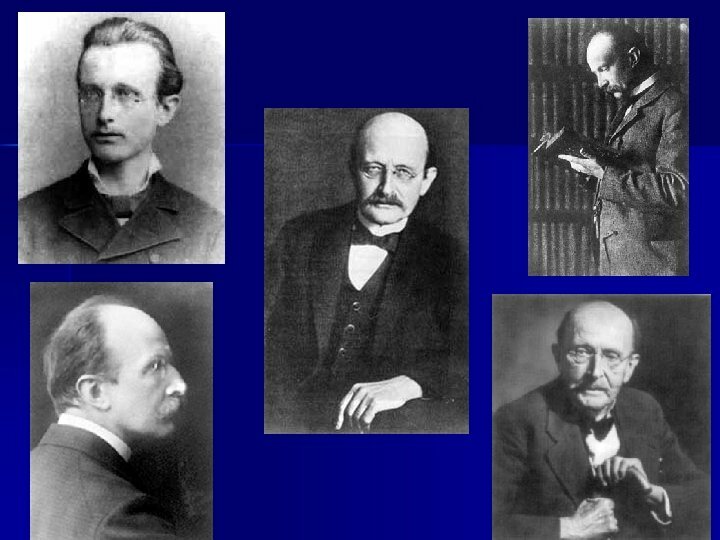 n After the death of Kirchoff, the University of Berlin looked for a new colleague for Helmholtz. They approached Ludwig Boltzmann but he was not interested, and the same proved true for Heinrich Hertz. 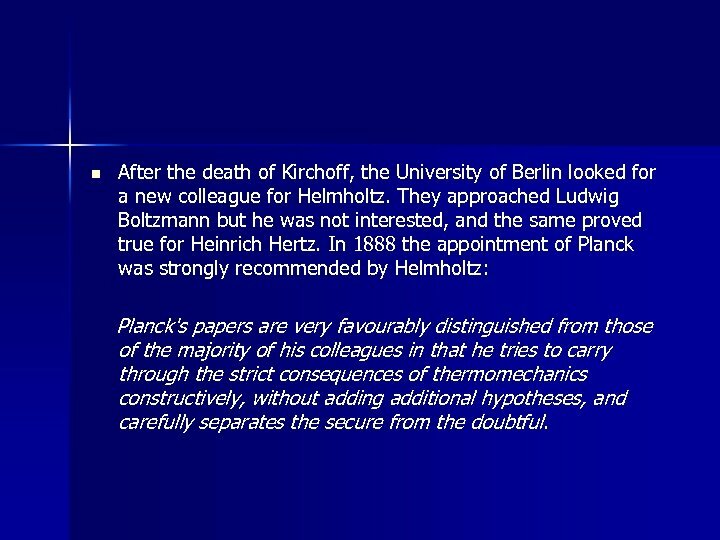 In 1888 the appointment of Planck was strongly recommended by Helmholtz: Planck's papers are very favourably distinguished from those of the majority of his colleagues in that he tries to carry through the strict consequences of thermomechanics constructively, without adding additional hypotheses, and carefully separates the secure from the doubtful. 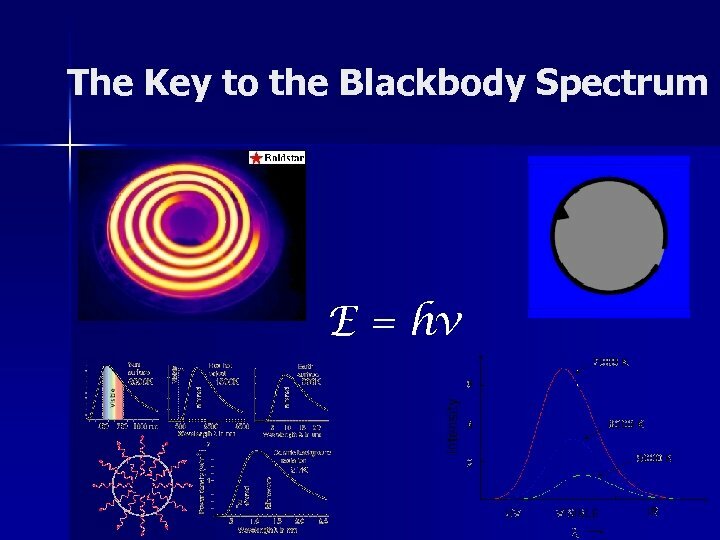 n Planck announced his derivation of blackbody spectrum in 1900, which was based on the revolutionary idea that the energy emitted by a resonator could only take on discrete values or quanta. 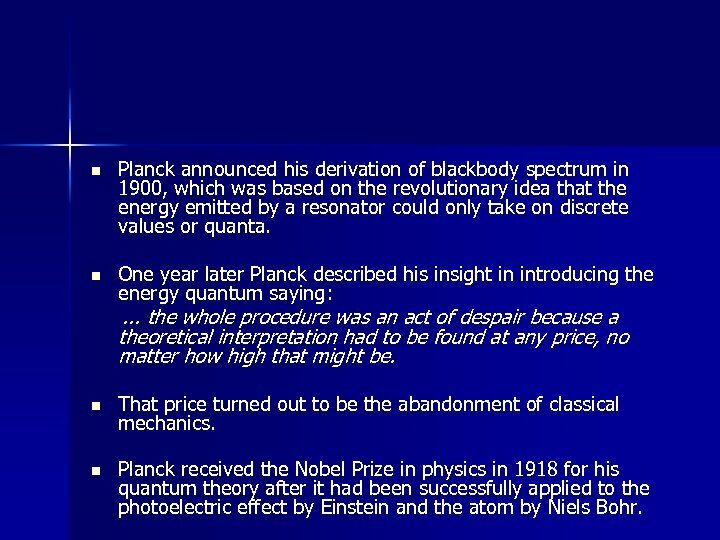 n One year later Planck described his insight in introducing the energy quantum saying: . . . the whole procedure was an act of despair because a theoretical interpretation had to be found at any price, no matter how high that might be. n That price turned out to be the abandonment of classical mechanics. 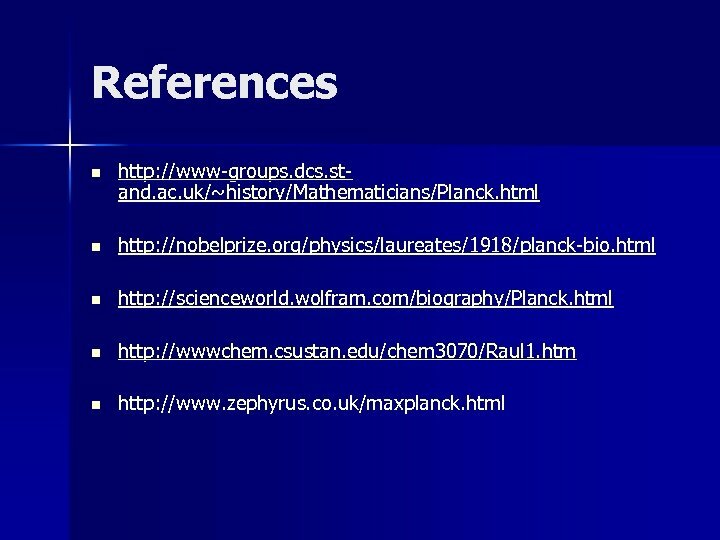 n Planck received the Nobel Prize in physics in 1918 for his quantum theory after it had been successfully applied to the photoelectric effect by Einstein and the atom by Niels Bohr. 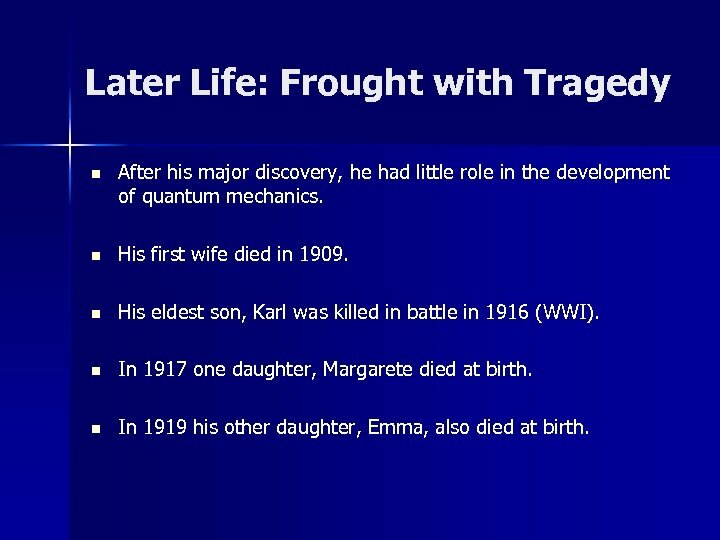 Later Life: Frought with Tragedy n After his major discovery, he had little role in the development of quantum mechanics. n His first wife died in 1909. n His eldest son, Karl was killed in battle in 1916 (WWI). n In 1917 one daughter, Margarete died at birth. n In 1919 his other daughter, Emma, also died at birth. n In 1944 his house in Berlin was destroyed in an air raid, burning his irreplaceable scientific notebooks. n In 1945 his son Erwin, who had been implicated in the plot on Hitler's life in 1944, was tortured to death by the Gestapo. 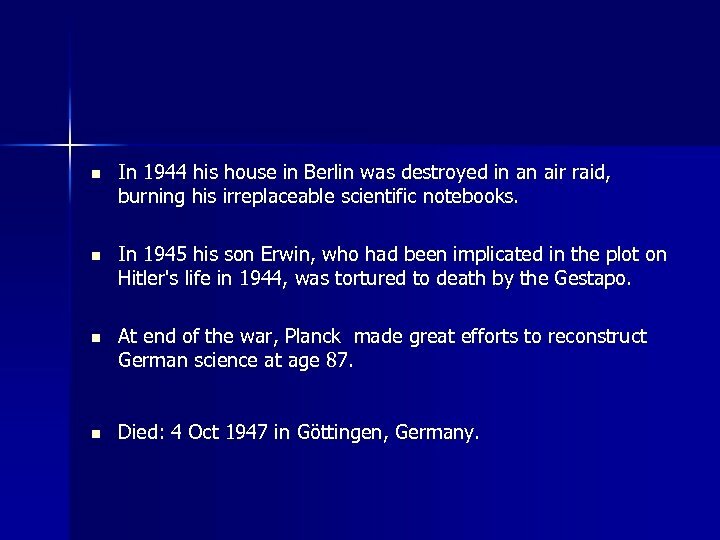 n At end of the war, Planck made great efforts to reconstruct German science at age 87. n Died: 4 Oct 1947 in Göttingen, Germany. 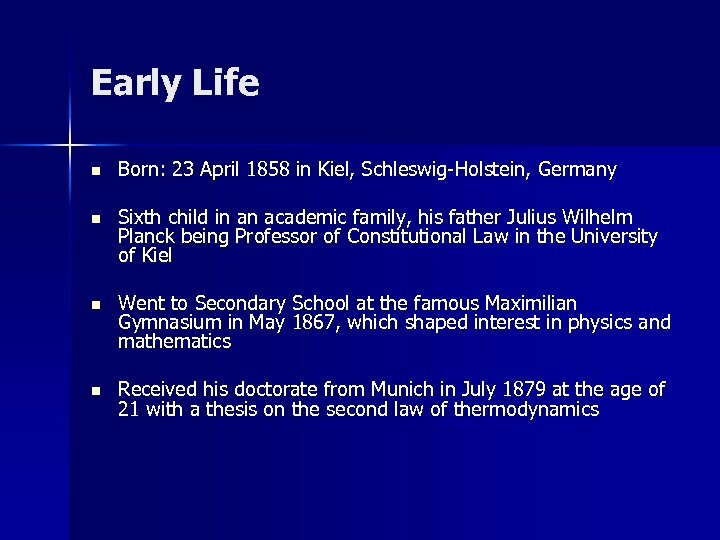 Other Interesting Facts n He was friends with Emil du Bois-Reymond (the famous physiologist), Helmholtz, Pringsheim, and Wein. n Planck was considered to be a man of such high personal integrity and wisdom that he was once allowed to speak directly with Adolph Hitler and convey his opinions against Germany's racial policies. 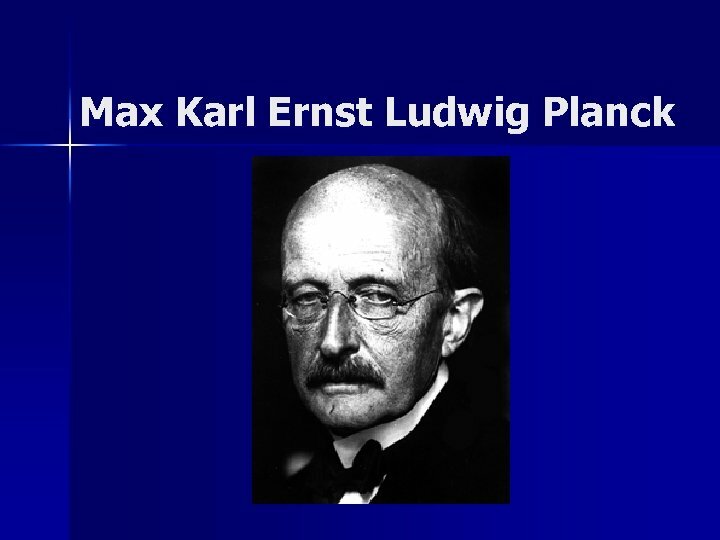 n He was the first to write down the equation usually attributed to Boltzmann (S = k ln. W). The constant k was first used by Planck in 1900. 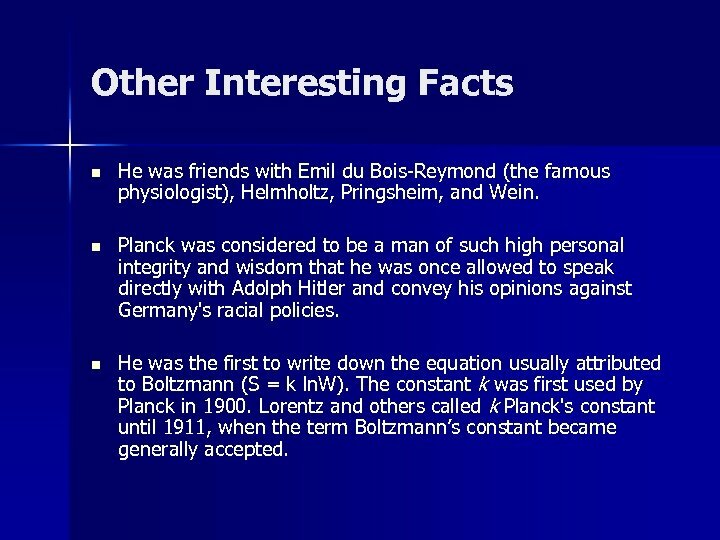 Lorentz and others called k Planck's constant until 1911, when the term Boltzmann’s constant became generally accepted. 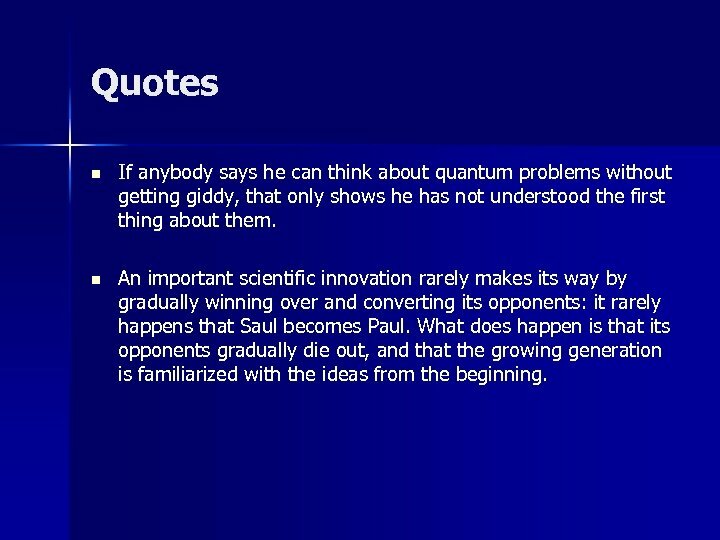 Quotes n If anybody says he can think about quantum problems without getting giddy, that only shows he has not understood the first thing about them. n An important scientific innovation rarely makes its way by gradually winning over and converting its opponents: it rarely happens that Saul becomes Paul. What does happen is that its opponents gradually die out, and that the growing generation is familiarized with the ideas from the beginning. n n At that time I held what would be considered today naively charming and agreeable expectations, that the laws of classical electrodynamics would, if approached in a sufficiently general manner avoiding special hypotheses, allow us to understand the most significant part of the process we would expect, and so to achieve the desired aim. . Because [a constant in the radiation law] represents the product of energy and time. . . I described it as the elementary quantum of action. . As long as it was looked on as infinitely small. . . everything was fine; but in the general case, however, a gap opened wide somewhere or other, which became more striking the weaker and faster the vibrations considered. That all efforts to bridge the chasm foundered soon left little doubt. Either the quantum of action was a fictional quantity, then the whole deduction of the radiation law was essentially an illusion representing only an empty play on formulas of no significance, or the derivation of the radiation law was based on a sound physical conception. 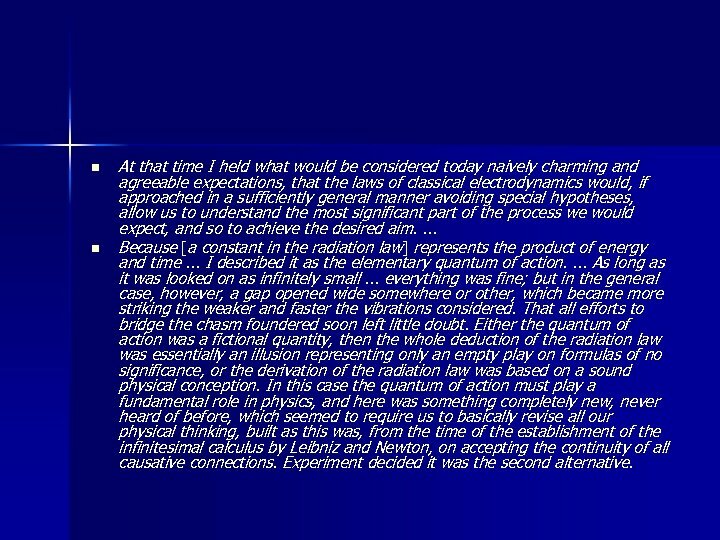 In this case the quantum of action must play a fundamental role in physics, and here was something completely new, never heard of before, which seemed to require us to basically revise all our physical thinking, built as this was, from the time of the establishment of the infinitesimal calculus by Leibniz and Newton, on accepting the continuity of all causative connections. Experiment decided it was the second alternative.